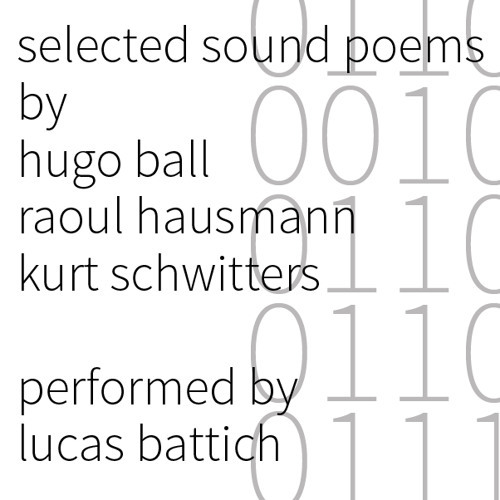 Selected Sound Poems by Hugo Ball Raoul Hausmann Kurt Schwitters Performed by Lucas Battich Readings from a selection of sound poetry from three pioneers in the form. All poems are originally composed of phonetic sounds, letter sounds and onomatopoeia and are completely meaninglessness as language in the usual sense. Can you translate nonsense? Today, near the centenary of Hugo Ball’s first sound poetry performance on June 1916, at the Cabaret Voltarie in Zurich, the text of these poems are easily available throughout the internet. To get there, however, they underwent a few changes. They became translated somehow: encoded. The ‘original’ dadaist poems became a surface with something added which they didn’t have before, yet something that is still language and can be read. The versions here performed are the complete poems in their encoded binary form.